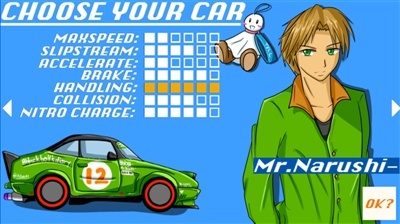 Slip Stream (26.9mb ver1.1.5 made by 8blackballgames 12/10/2014, no install .zip) is a basic 2d side scrolling Japanese racing game where you must finish the race in 1st place. When you do you will unlock 1 of the 10 unlockable characters and cars. Watch out for emergency vehicles and drive over the Nitro boosts icons for faster speeds and to add to your nitros bottle. When you have a full nitos bottle you can use it for more speed. 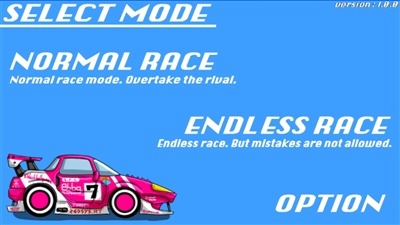 You have a choice of 2 characters and their cars at the start of your race and there are also 2 game modes, Normal Race and Endless Race. 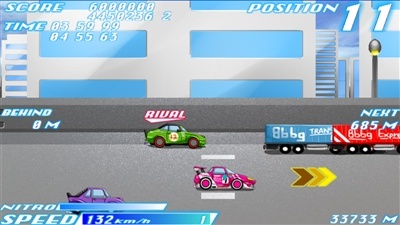 It seems like a largish game file for such a simple car racing game and it looks and play like a flash game, maybe it will end up as one. On starting the game, left click with your mouse on the game screen. Esc key] - Return to mode select.